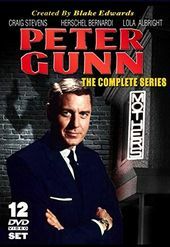 Filmed in a film noir atmosphere and featuring Henry Mancini music that could tell you the action with your eyes closed, Peter Gunn worked in style. Known as Pete to his friends and simply as Gunn to his enemies, he did his job in a calm cool way. He got his tips and cautions from Lieutenant Jacoby, a coffee drinking pal from the police. Also providing tips was "Mother" of her self-titled nightclub. Working at the nightclub as a singer was Edie Hart, his girlfriend.